Over the course of the last 10 years organizations have invested heavily in developing internal compliance and risk management leading practices in technology. This has been necessary to meet the emerging regulatory requirements. These investments have largely been considered sunk costs within the organization. Today, however, leading-edge organizations are leveraging these investments to realize measurable advances in process optimization. Reaching beyond foundational compliance objectives, technology is being utilized to enhance process controls that aid in minimizing revenue loss, cost leakage and fraud – three issues that have a significant impact on profitability. In this session, Oracle and Deloitte will share ways in which technology and leading practices in GRC can be leveraged to contribute favorable results to the bottom line. 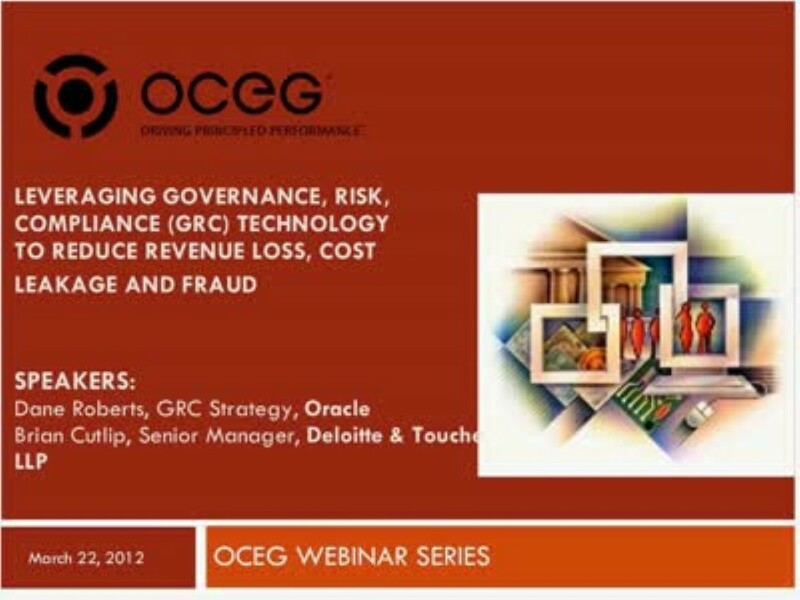 We have emailed instructions to access Leveraging GRC Technology and Leading Practices to Reduce Revenue Loss, Cost Leakage and Fraud to . Make sure the email arrives in your inbox: either add "support@oceg.org" as a safe sender to your email platform, or if you use Gmail, drag our email into your Primary tab.